What is the average cost for a smart home security system? What key features should you go for? What range does the tech have? Is there any back-up power supply? How simple are smart home security apps to use? Do they work alongside other smart home gadgets? How likely is a smart security system to keep out burglars? What is a Video Doorbell? Security has always been a concern for property owners, both home and office (or other facility), but it has never been easier than it is today. The following guide will help you familiarise yourself with smart security tech, and feel confident in purchasing and installing it in your own home. Our existing system of wireless telephone and data systems allows us to link devices and systems together to produce an efficient, reliable security system, and advances in technology and production have meant that the cost to do so has dropped dramatically. Instead of thousands or tens of thousands for a security system, we’re now talking hundreds. Wireless and convenient, these systems provide a cost-effective solution to this age-old concern. 24-7 monitoring, from anywhere in the world, with the hub and control panel in your pocket. There are still very sophisticated systems for industrial or high-need security facilities, and these can be expensive and include third-party monitoring and response services, but for most people’s needs – and this goes for many companies, too – the smart-phone-based solutions are effective and much more economical. Most of them are designed to evolve as well, so as your needs increase, the system can adapt and elevate to suit them. In addition to security needs, these products can control heating, lighting, and other devices in the facility, allowing for more regulated and efficient use of energy and time. These systems are great security solutions, but they are more than that too. A smart security system is the network of security cameras, locks, motion and shatter sensors, noise sensors, and similar devices that are designed to detect unauthorised incursion onto your property. Most of these are controlled and monitored using a hub – a small box attached to the broadband router. The hub collects and sends information to your phone or tablet, which displays them to you, often with some form of analysis or trigger to alert you of any suspicious or unusual activity. If any of the sensors detect a change – a shattered window, opened lock, or motion in a secured area, for example – the hub sends this information to the phone or tablet, which determines that it is unauthorised activity, and alerts you, and/or any monitoring personnel or service you are working with, including private security firms, police and fire services. Many systems allow you to talk through them as well, so if an authorised employee forgets to key in a deactivation code, or your children come home from school and accidentally trip the alarm, or some other non-emergency situation, you can quickly identify it and respond accordingly, cancelling emergency response and resetting the system to an appropriate setting. You can even tell your dog to get off of the bed, or your cat to get off of the table… not that the cat will listen. Smart home security isn’t just about keeping burglars out, it can help you monitor in-home care for the elderly or ill, monitor the care and safety of children during babysitting, open and close windows and skylights in response to weather changes, adjust appliances for greater efficiency and power savings, monitor pets and appliances for safety reasons, and more. It’s not as much as it used to be. For about £200 you can get a smart security system that includes a camera, a door sensor, and a hub. The cost of adding more sensors to cover your whole home depends on the size of your home, the number of doors and windows, etc. Window and door sensors cost about £30 each, and cameras start at about £100 for a reliable one. You’ll want to use the same brand for the whole system, to ensure it works together properly and is covered by warranties etc., so look at the total cost before you choose a system; it might be worth it to pay a bit more for the hub, for example, if the cameras are cheaper and you need several of them. As a rule of thumb, budget at least £500 for a 3-bed house. Some platforms require a monthly subscription fee too, for the best features at least, which ranges from about £3 to £8. Cameras You’ll want several cameras, most likely, and perhaps more than one kind: a couple for indoors and a couple for outdoors. Placing them strategically can mean covering a whole floor without having one in each corner. There is no point in monitoring a certain area, in many cases, of an intruder would need to pass through other monitored areas to get there. If you’re planning on using the camera for monitoring a pet or vulnerable family member, however, you’ll need greater coverage. Consider additional sensors too. Motion detectors or heat detectors can be useful in certain circumstances. Sensors Motion sensors are a great way to provide coverage, without invading privacy. Someone may not like the idea of a camera in a bedroom or restroom, for example, but detecting an intruder into either of them may be important. Siren Several available systems include a siren. This is a loud, disturbing noise, designed not only to wake legitimate inhabitants of a home, but to disturb intruders too, which often makes them flee before stealing or destroying property any further. Canary and Somfy already offer this feature in their one-box systems, and it is expected to become more popular. Most systems have a Wi-Fi range of 20-50 metres. The lower end of the range will not be suitable for medium- to large-sized homes, and even the 50m versions will not suit some large facilities or gardens. Some providers, Panasonic for example, use a separate wireless system to increase range to the required distances. It is important to consider black spots too. Some features (such as massive fireplace chimneys or foundations and pillars) can block signals, and in such cases steps must be taken to compensate. The placement of the hub, the addition of a relay, or use of a wired component are possible solutions to this problem. Most systems and components have rechargeable batteries integrated into them. These are kept topped up by the mains power system, and instantly supply power if it is cut or the mains supply fails for any reason. Your system will continue to function as normal for 24-72 hours without power. In most cases, however, you will not receive smart phone alerts during a blackout. In the event of a power cut, the battery-powered sensors and cameras will continue to work, and many mains powered hubs have battery backup that will last 24-72 hrs. During a blackout you won’t receive smartphone alerts. This varies with the app, of course, but most are designed to be used by non-technical people, so they generally use clear displays and directions. Even some of the more advanced features, like using your phone’s GPS ability to turn alarms on and off as you leave and return to your home, are quite easy to set up. Sensitivity of cameras and other sensors can be adjusted too, so your caged budgie doesn’t keep setting off the alarm when you’re at work. This depends on the brand. Panasonic and Yale only work with their own components; Samsung’s SmartThings is more versatile in that regard. The more they will work with other brands, the less secure they tend to be, so the choice of brand depends on the severity and sophistication of your security and monitoring needs, and the benefits of using multiple brands. If a siren goes off and they flee, then yes – but in most cases this is a means of getting emergency response people, such as police, to the scene as soon as possible. It also helps this to happen even if you aren’t able to call the police yourself. Prevention comes first (locks, lighting, etc. ), alarm second (flashing lights, sirens, warnings), and the arrival of emergency response personnel third. Video doorbells are not only useful security features, they are also functional for other purposes. You’ll be able to tell if someone stopped by while you were out, or can even talk to visitors remotely via the doorbell system – they don’t even need to know you’re not at home. You can direct delivery people to leave packages in a safe place, rebuff unwanted sales-calls, and deter thieves who may be posing as legitimate visitors in order to determine if the home is empty and therefore vulnerable to undetected break-in. Most video doorbells can be set to record once motion is detected, so you won’t be relying on someone pushing the button, either. 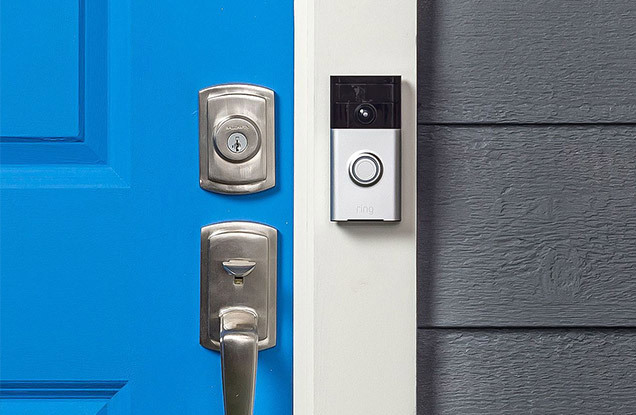 Most of these devices are wired into your existing doorbell hook-up, or there are battery-powered versions as well. Many are compatible with smart home security systems and can be integrated as part of a broader network of devices. You’ll want a model that uses hi-res (1080p) picture quality, and an angle of 140 to 180 degrees, for clarity and full coverage. A doorbell that records what happened just before the button was pressed can also be useful. A Z-Wave or Zigbee smart lock can integrate with an existing system pretty easily. 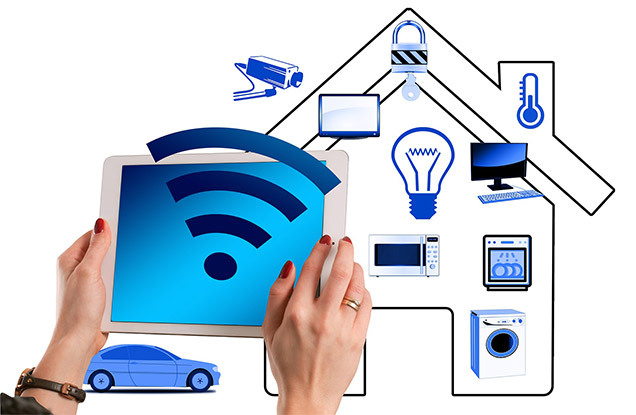 If you don’t have a smart home hub, there are Wi-Fi and Bluetooth options that each come with a mobile app that will allow you to control them in much the same manner. Some require a bit of additional installation work, while others install in the existing setting, much as a non-smart lock would. Depending on the model you choose, you’ll be able to open and secure your lock remotely, create temporary or permanent schedules, set the lock to secure when your phone moves out of a certain range from the house, use voice control to open and engage the lock, link to your Alexa, Siri, or other assistant device, and more. Some even use fingerprint or face recognition to open the door, so you’ll never need to worry about losing your key – this is a great feature for children, too. Take a look at the August Smart Lock Pro + Connect to check out a great example. Matt is constantly knee deep in the technical space, with knowledge of digital products, websites, marketing, and all things tech! He's using the website to document his ideas and opinions on smart home technology, as it evolves into the mainstream. Browse our latest in depth guides on smart tech now. Sign up now to be notified of early deals.